Looks like JAR copy/pasta that hisself. Dont you mean have a bypass? I actually like his #5. Guy who can’t post a gif, copy/ pasted that? Proper grammar, correct spelling, and complete sentences prove neither JAR nor Donald Trump wrote it. 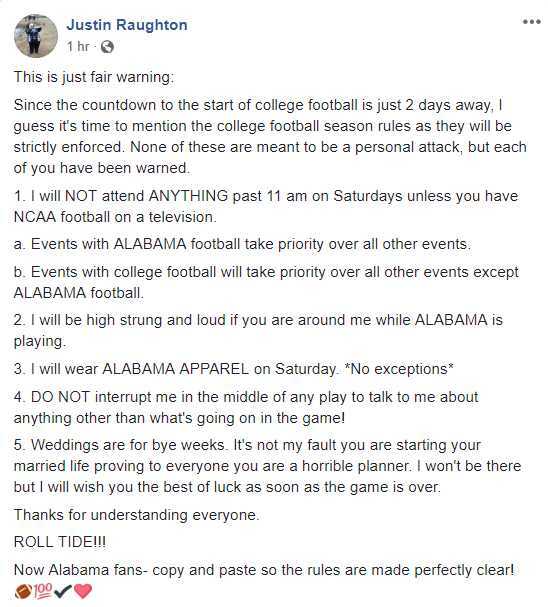 Heck, an Alabama fan probably didn't write it, either. I wish that I could get married again to intentionally schedule my Bachelor party for the MNC game and then have my wedding on Super Bowl Sunday with NO TV WATCHING ALLOWED. My wedding gift will be that you ignore footbaw for one day in ur god forsaken life (Best Men must ignore it for 2 days). I was SOOO close this year! this was bold. maybe next year willie! Fresno State ahead of ur prediction. They'll win 11 if they win their bowl!